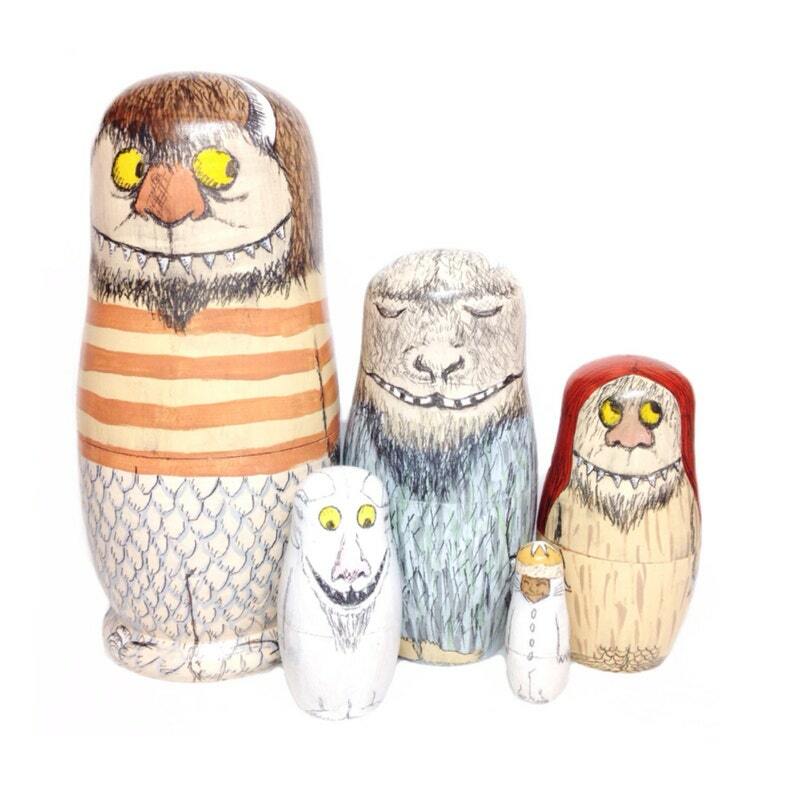 this listing is for a set of 5 hand-painted wild things-inspired nesting dolls. each piece is hand-painted with care in an original design. please allow for variation - your piece will not be an exact match to the set pictured. in fact, it will probably be even better :). single dolls and sets come with a muslin bag and gift packaging ready for giving! please allow 10-12 weeks to create your masterpiece. wooden nesting dolls range from 5 1/2" high & 2" wide to 1 3/8" high. AP certified non-toxic acrylic paint and sealant. perfect for your little one or as a gift for another little one! (keep in mind not TOO little, as all small toys pose a choking hazard in the wrong hands and mouths.) contact me to customize a listing for larger dolls for your littler ones. questions? please contact me for more information and to set up a custom order. combined shipping discounts are available. please contact me with a shipping request when purchasing multiple items BEFORE you place your order. i will gladly send you an updated shipping cost reflecting the discount. international shipping and u.s. outlying states, shipping is an estimate. anything paid over actual shipping costs will be refunded within shipping time. if you would like to know cost of shipping BEFORE you pay, please contact me & i will set up a custom listing with exact shipping cost. *please note international VAT charges may apply. unfortunately there is no way to determine this & sweet whimsy designs cannot be held responsible for charges that incur once package leaves the US. * thank you. thank you for visiting! we hope you enjoyed your stay! Absolutely love them . I had been wanting to make the purchase for a couple of years and finally did. Once they arrived I almost didn't wait give it to my daughter for her birthday as each doll is so amazing . The detail is wonderful. I waited in anticipation for these to arrive and they were even more detailed and wonderful than I expected! The way the package arrived was adorable. I was so excited to give this as a gift. I love how personal it was with little extra touches in the package. full payment is expected to begin creative process. reserved listings are priced individually depending on your requests. we are happy to accept your return item should you find a problem. custom orders can not be returned. please let us know if you are dissatisfied with your purchase & we will be happy to help. we will be happy to combine shipping for multiple items - please contact us with a shipping request BEFORE making your purchase and we will send you a discounted combined shipping rate. thank you! wholesale available as of january 2015 - contact us for information & pricing. for collaboration inquiries, please email us at swdcollabs@gmail.com. How long should I expect to wait for my item(s)? our turn-around time is dependent on what you ordered, the quantity, and the time of year. we try to maintain a 1-2 week turn-around time for items in the shop & a 4-6 week turn-around time for custom pieces, however this varies. please contact us for an estimate on your order’s shipping time! If interested in custom pieces, please send us a message. Once your purchase is made, you are welcome to send photos and descriptions to us via message. For custom dolls, we suggest provide head-to-toe photos of those you would like created into peg dolls, as well as photos and/or descriptions of any accessories or details you would like added. Any item can be personalized! Just add the personalized listing to your order & leave a note as to what personalization you would like in the comment/notes section at checkout!